New York Times Cooking site with a breakdown of what they think people should have in their kitchen pantries for the basics of cooking, expanding the list depending on the competency of the cook. A neat short Twitter thread from Humberto Rosa, Sony’s lead animator from his work on Spiderman: Into the Spiderverse, diving into a 2-second clip of Gwen Stacy drumming. 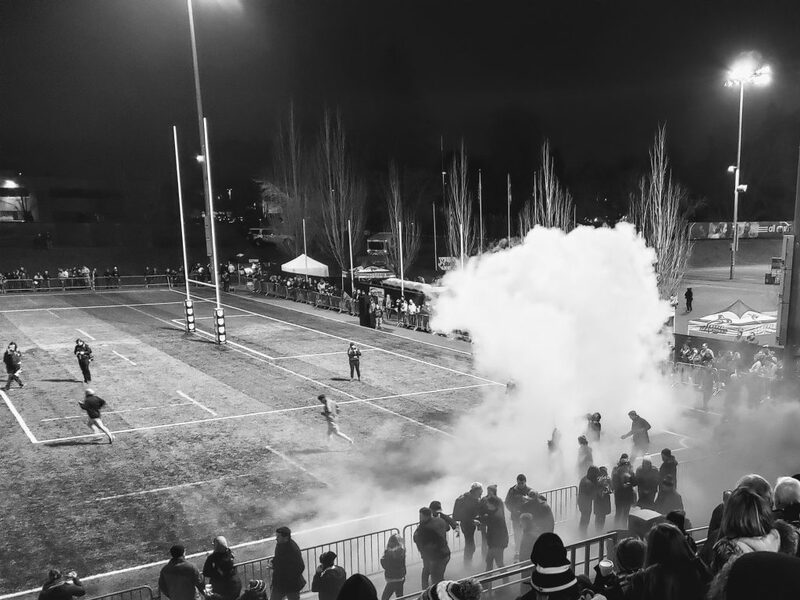 Tonight was the Seattle Seawolves home opener, our Major League Rugby team. I snapped this from the opening ceremonies with the players running out onto the field. The idea that we might have made a discovery which could prove the key to to stopping Alzheimer’s is truly exciting. I’m not ready to call it a done deal, but it could be huge news if it proves true. Ahmed Best was just 26 years old when he played Star Wars’ Jar Jar Binks. In this video by SoulPancake he opens up about the toxicity and hatred he faced which nearly drove him to suicide. NPR did this really great webpage with book recommendations of all kinds from 2018. 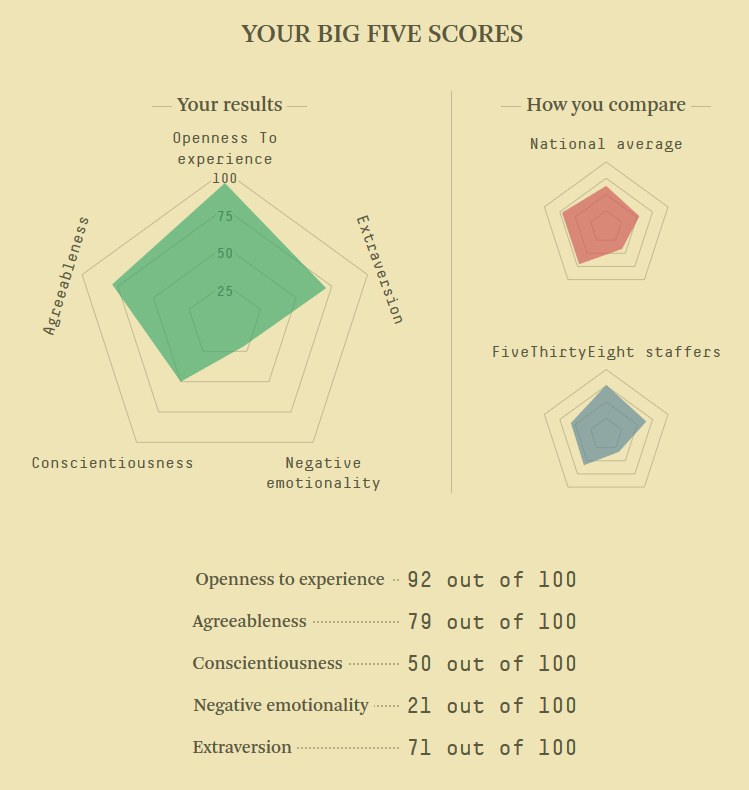 My results after taking 538’s new personality test. How to Fix Social Media by Injecting A Chunk of the Blogosphere. Bill Gates editorial in the Wall Street Journal discussing the byproduct of his health investments in his post-Microsoft career, which is that having more healthy people creates wealth since they are able to be up working or going to school. He shares this in the WSJ, to try and convince other rich people to follow in his and Melinda’s footsteps, as there can be less trust in the government to continue its foreign aid. There are areas of global health where the data is spotty and we don’t know if an investment will pay off, or what would happen if we don’t invest at all. This isn’t one of them. Institutions such as Gavi, the Global Fund and GPEI are the closest things that we have to surefire bets to alleviate suffering and save lives. They are the best investments that Melinda and I have made in the past 20 years, and they are some of the best investments the world can make in the years ahead.